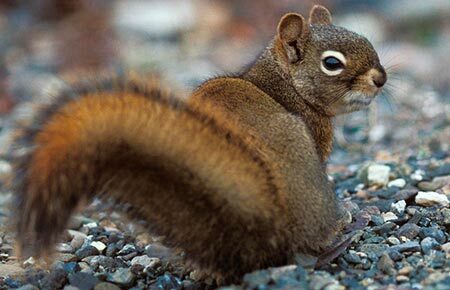 Red squirrels are primarily diurnal, but have been occasionally observed exhibiting nocturnal behavior, collecting food on moonlit nights. The red squirrel (Tamiasciurus hudsonicus) makes itself quite conspicuous with its lively habits and noisy chatter. Cone cuttings on stumps or rocks are common and tracks in snow are numerous where this squirrel occurs. It can be found in spruce forests over most of Alaska and has a wide range in North America. It occupies a wide variety of forest habitat, occurring in the hardwood forests of eastern North America and the coniferous forests of the west and north. The active rodent averages 11 to 13 inches in length (28–33 cm), including tail, and is a rusty-olive color on the upper parts of its body with a whitish belly and underparts. Their distinct reddish color differentiates the red squirrel from other squirrel species and is a good way to identify them. In summer, a dark stripe on the side separates the upper rusty color from the white of the belly. The bushy tail is often a lighter orange or red with light tipped hairs. Red squirrels are solitary but pair for mating in February and March. Females usually breed when they are 1 year old. Red squirrels are territorial but males must temporarily leave their territories to find a reproductive female, and then return after mating. This results in a scramble competition mating system, and multiple breeding partners are selected by both males and females. Females demonstrate sexual selection preference for behavioral rather than morphological characteristics of males. Age has a slight correlation to reproductive success in females. Litter size, and survival of offspring decreases in females over 6 years of age. Male and female red squirrels also show an age specific allocation of energy to reproduction. Young, healthy females display a higher allocation of energy to reproduction and mature females display a more moderate allocation of energy to reproduction. High reproductive success at a young age however, has a negative effect on reproductive success in subsequent years due to detrimental effects on females’ health from breeding while still developing. In contrast, young females with a lower reproductive success rate have been shown to have a higher reproductive success rate in subsequent years. Reproductive success during the first year of breeding is most likely due to availability of resources to that individual during their first year. Three to seven young are born after a gestation period of 36 to 40 days. The young are born blind and hairless, weighing about ¼ ounce at birth. They are weaned at about five weeks but remain with the female until almost adult size. The young leave the female and are independent during their first winter. This means that they have to be successful at gathering and storing a winter's supply of food. Much of the red squirrel's time in the summer is spent cutting and storing green spruce cones. There may be several bushels of cones stored in a cache. Caches may attain a diameter of 15 to 18 feet and a depth of three feet. In addition to one larder-hoard, they may also scatter-hoard their food supply in small caches throughout their territory. Red squirrels also cache mushrooms on tree branches. They eat seeds, berries, buds, fungi, and occasionally insects and birds' eggs. They are busy collecting and storing food from early morning until dusk and also on moonlit nights. Red squirrels are also known to pilfer from other red squirrel caches given the opportunity. Pilfering rates vary among different populations of red squirrels due to age structure and food availability. Young, inexperienced red squirrels are the most likely to pilfer, as well as individuals with an inadequate cache to last the winter. Red squirrels are not migratory. 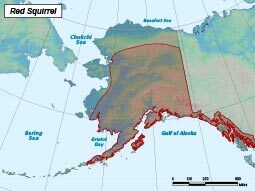 The red squirrels range extends throughout most of forested Alaska. Their northern extent is at the crest of the Brooks Range, and extends all the way through southeast Alaska. Red squirrels are territorial, and build nests which may be a hole in a tree trunk or a tightly constructed mass of twigs, leaves, mosses, and lichens in the densest foliage of a tree (making the nest almost completely weatherproof). A loose mass of twigs and leafy debris in a high tree is used as a “fair weather” nest. Their ground burrows, also known as middens, are used mostly for food storage. There is usually one large active midden in each territory with perhaps an inactive or auxiliary midden. The home range of red squirrels is about one-half to one acre but can be as great as six acres, and each squirrel knows its territory well. Each squirrel has several nests in its territory and always seems to know which retreat is nearest. Territorial behavior seems to be most rigid during caching of food and relaxes somewhat in the spring. The red squirrel is active all year but may remain in its nest during severe cold spells and inclement weather. They are agile climbers and, being extremely curious, will often attempt to enter buildings, upsetting anything they can move and gnawing on woodwork. Once in a house or cabin, they can be very destructive, tearing out insulation and mattress stuffing for use as nesting material and caching food stores in any available niche. Red squirrel population trends are not monitored in most areas of the state. In a few game management units, trapper questionnaires indicate red squirrels are stable to increasing, however, this type of information is not available for most of the state. A loss of spruce forest habitat over large areas of south-central and southwestern Alaska due to insect infestation, and clear-cut areas were vacated by red squirrels. Red squirrels were also found to make detours to travel around clear-cut areas. Range extends throughout most of forested Alaska; northern extent is at the crest of the Brooks Range and extends all the way through southeast Alaska. Diet consists of seeds, conifer cones, nuts, fruits, and fungi. Occasionally feeds on invertebrates and small vertebrates. Breed once per year in February and March. Females typically give birth to litters of three to seven offspring about five weeks later.